Calling all chocolate lovers! 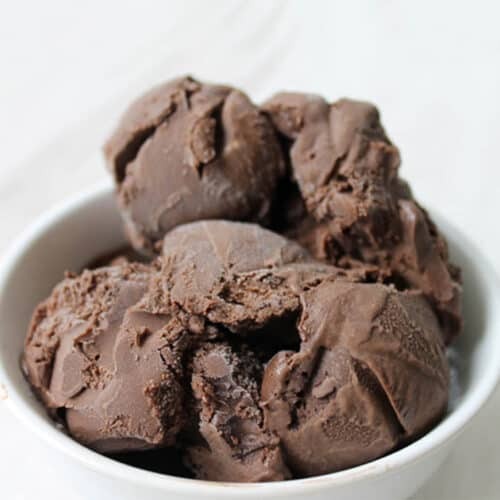 This decadent homemade chocolate ice cream will have you in chocolate heaven. Its rich, creamy and over-the-top delicious! In a small to medium sauce pan, bring heavy cream and cocoa powder to a simmer. Remove from heat and add in chopped chocolate, stirring until melted. Pour into medium bowl and set aside. Clean out sauce pan. Pour in milk, sugar and salt. Simmer on medium heat until sugar is dissolved, about 5 minutes. Remove from heat. Take 1/3 cup of mixture and add slowly to beaten eggs yolks, stirring constantly. Add another 1/3 cup and stir well. Add slowly back into sauce pan with remaining mixture. Return to medium-low heat and cook until thermometer reaches 170 degrees and mixture coats back of spoon. Add this mixture to cream-cocoa mixture along with sour cream and vanilla. Stir well then strain. Cool to room temperature then chill for 24 hours. Churn in ice cream maker according to manufacturer’s instructions. Mine required 40 minutes. Of course, if you don’t want to churn it, just put it in an airtight container and place in the freezer for at least 4-6 hours. If you love ice cream sandwiches, this goes great between two cookies, like our Cookies & Cream Cookies, or with our ice cream sandwich wafers.